If you’re interested in learning calligraphy, but haven’t been able to get started, this is the class for you! Learn the cheapest, easiest and most fun way to write beautifully with the craziest of instruments: a magic marker. In this day long class, Colin and Veronica will give a short introduction into the art of calligraphy followed by in-depth tutorials of the basic fundamentals and techniques to achieve stylistic results and incorporating your writing into a hand lettered piece. This is a beginner level workshop. All materials will be provided, so just bring yourself! This workshop includes lunch (Catered platters from Oscar's Ale House). To learn even more about our workshops, click here. Am I right for this class? 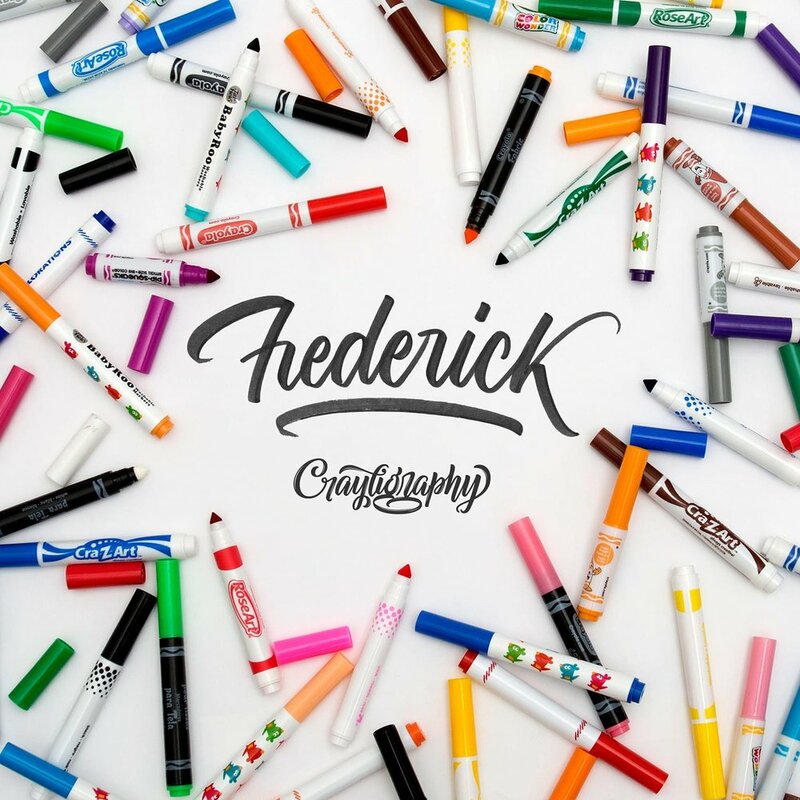 Do you have little to no experience in the art of calligraphy and hand lettering? Are you a part of the larger group who is scared to get started because you don’t know where to begin? If so, this is the class for you! Colin is the guy behind Crayligraphy. He runs Tierney Studio, an independent design company specializing in lettering, calligraphy, illustration and branding. Colin has worked with clients from all over the world and his work has been published in several books, featured on the web, recognized & awarded around the globe. Veronica is a lettering artist based out of Denver, Colorado. Drawing letters has been her passion since she was first exposed to the wonder of typography in her graphic design classes at the University of Central Florida. Veronica loves sharing everything she’s learned in her lettering journey with others through her Instagram and blog. Registrations are allocated and guaranteed only upon receipt of full payment. You may cancel at any time although no refunds will be given 14 days prior to the beginning of the workshop(s). I reserve the right to alter or cancel any workshop at any time. For reasons including, but not limited to, too few participants, adverse weather, instructor illness, family emergencies, logistical problems such as strikes, wars, or any other circumstances, which may make operation of the workshop inadvisable. If any workshop has to be cancelled prior to the start date of the trip all fees are refunded in full. If for some reason the workshop needs to be cancelled after it has begun, there are no refunds. I also reserve the right to cancel any workshop with inadequate enrollment 14 days beforehand. In the event that a workshop has to be cancelled due to inadequate enrollment, your ticket will be refunded in full. I am not responsible for any expenses or damages incurred by workshop members as a consequence of any cancellation, such as costs expended in preparing for the trip including non-refundable or penalty-carrying airline tickets, equipment, lost income, or any other trip-related losses or expenses. The workshop cost includes the tuition fee and materials. All other expenses are the responsibility of the participants. Not included are any airfares, airport taxes. pre and post workshop accommodation, entrance fees or items of a personal nature. Price also excludes any insurance coverage for trip cancellation or interruption, travel accident, travel delay, baggage delay or baggage theft, medical or hospitalization expenses. I strongly recommend you have travel insurance, including coverage for personal health, emergency medical evacuation, emergency medical expenses, and trip cancellation, which would reimburse you for non-refundable airfare and trip cancellation fees. I cannot accept liability for insurance costs, loss of deposits, airline cancellations or delays or penalties incurred by the purchase of non-refundable airline tickets or other expenses incurred by participants in preparing for any of my workshops. I cannot accept liability for any insurance costs if a workshop is cancelled for any reason. In the event of medical emergency and/or repatriation from a workshop by whatever means, the responsibility of such costs will be borne by the client. It is therefore essential that adequate cover is in place. I strongly recommend that you take out an insurance policy at the same time as booking. Every participant voluntarily assumes all risks and will hold me and any co-leader or assistants, harmless from any and all liability, actions, causes of action, claims, debts, and demands which arise in connection with the workshop. The terms hereof shall serve as a release and assumption of risk for your heirs, administrators, and executors, and for all members of my family, including any minors accompanying you. Payment of your booking fee represents your acceptance of all terms and conditions outlined on this page. I aim to provide every participant with a safe, educational and enjoyable experience during the workshops. As there is always certain risks and dangers associated being a human in this crazy world, I accept no responsibility or liability for injury, death, illness, accident, losses or additional expenses associated with workshop participation. Nor do I accept responsibility for damage to equipment, property or digital data loss. Your medical needs and travel insurance are your own responsibility. You are also responsible for your own food allergies. I shall have no liability for any damages, losses, or expenses of whatever cause or nature, including those resulting directly or indirectly from acts of God, detention, annoyance, weather, quarantines, strikes, civil disturbance, theft or criminal activity of any kind, government regulations, etc., over which we have no control. I reserve the right to take photographic or video records of any workshop, and may use any such records for promotional and/or commercial purposes (unless you specify otherwise on the signup form or via email). All workshop schedules and plans are tentative. I reserve the right to change, at my exclusive discretion, schedules, plans and venues, depending on weather, health or safety considerations, attendance, or any other factors. By submitting the booking form and/or registering for a workshop you are agreeing to all the terms and conditions listed above. The person who submits the booking form does so on behalf of all the individuals included on it, so that all are bound by the booking terms and conditions.